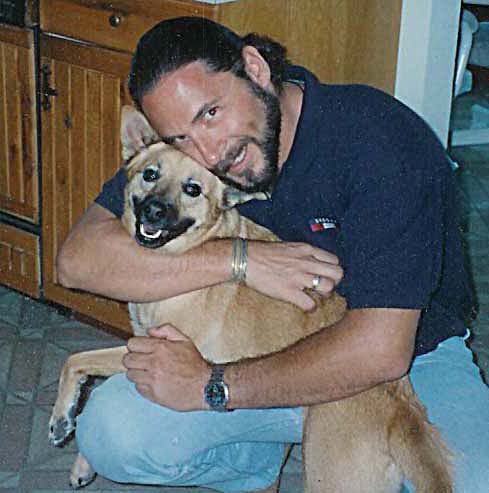 Living in Central America and also having served as a certified animal cruelty investigator in the US has been a real double-edged blade. Since moving to Panama I always remind myself that you can’t help them all. My opinion is education is the key; and people also learn watching by example, and I try to set one. Most people talk about the animal abuser as someone who knowingly commits acts of cruelty for power, amusement and torture over a creature that cannot defend itself. In Panama I have witnessed frustrated owners striking dogs for not behaving and dragging dogs by a back leg. 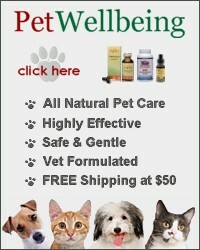 When I have talked to these owners they simply don’t get it. What you see here is a society as a whole that does not view animals as something to revere, rather a possession. Many do not feel it necessary to ensure comfort or consider the feelings of this possession. Let me say that there are exceptions. This was something I had to come to terms with when I moved to Panama. 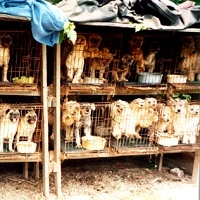 It’s common to see dogs chained, starving, ridden with parasites and mange not to mention abandonment and neglect. As a matter of fact an owner that chains their dogs is usually one of the more respected just because they care enough about their animal to keep them from roaming the streets. Recently the first ever real animal cruelty ordinance has been passed. I don’t know where they got their information from but it seems that they have tried to address the more critical avenues. The charges range generally from $100 to $1,000; and in some areas this may also include community service. Article 18. 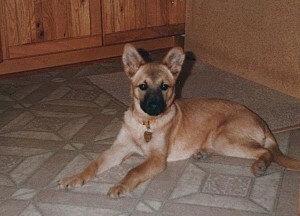 In addition to the penalty provided in the preceding article, an order for the rescue of the pet pr domestic animal will be issued and temporary transfer to an animal protection organization or shelter of the municipality for safekeeping, care and safety will be arranged, when an owner or responsible for custody of pets or domestic animals contravenes the provisions of this Act. The pet or domestic animal will be treated and admitted in accordance to the guidelines of each association or protective entity. In this case, the costs incurred will be paid by the owner or responsible for the pet or domestic animal. 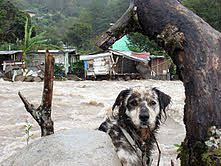 There are no qualified shelters or rescue organizations in Panama. I have heard of one “shelter” in Panama City but unfortunately I also know it’s not somewhere we would want any stray dog to end up under any circumstances. The problem is with lack of education in a combined culture it’s going to take years to bring the standards of animal care up to what I feel is an acceptable level. 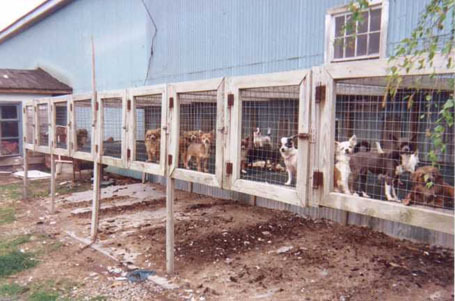 If we were to build shelters right now with the lack of enforcement they would quickly become overrun with throw-away dogs and would become no more than a place of constant euthanasia. There is no enforcement right now in Panama. No animal services. No cruelty investigation. We would have to rely on police to enforce ordinances and since they are completely uneducated, it makes the situation impossible. Thanks to organizations like Spay Panama and Amigos de Animales who’s volunteers take in strays and injured animals and tirelessly put fourth the effort to do what they can o find homes for these animals. 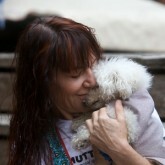 Both Spay Panama and Amigos de Animales are spay and neuter organizations and not rescues. I applaud every one of them. Our new ordinances are a start. Times will change. It’s going to be an ongoing battle to educate the people behind the badge. However these new ordinances are moving our Country in the right direction. I recently spoke to a man about his dog. He was remarking that his one year old dog has so many behavioral problems because it is still a “puppy”. I have heard this excuse often. I have met dogs that the owners complained about that were four year old “puppies”. For some reason many people believe that if your dog is a puppy then they don’t have to be well behaved. Whether your dog is four months or four years, it’s important to learn how to communicate with them. I’m not sure how frustrating it must be to a dog with an owner that won’t attempt this, but I would hate to hear what a dog would really say if they were ever given a voice. If you have ever watched dogs they are almost constantly communicating with each other. We as humans only understand a very small part. It’s fascinating to watch the non-verbal eye contact and what response they get. I recently had a litter of puppies. 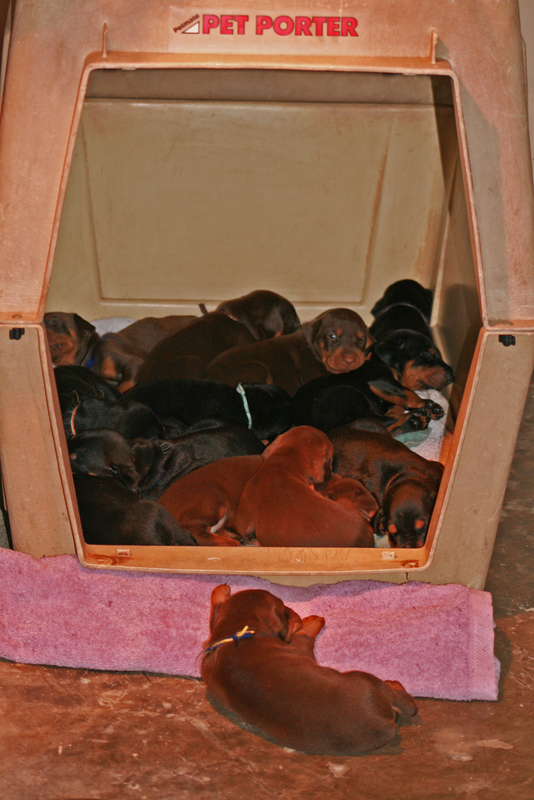 The mother was inside the box and my older Doberman came to the side of the box to look at the puppies. There was no problem with this. Soon another dog, not a part of our pack, joined the Doberman so see what was inside the box. 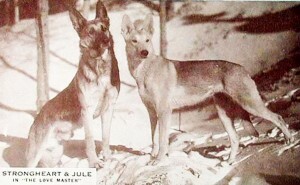 The mother dog didn’t growl, posture, get up or show any sort of aggression. She just looked at the dog. Not a sideways glance (a term called “whale eye”), no shifting of the head what so ever. She just looked. Immediately the second dog backed away and the mother quickly shifted her attention back to the litter. I am constantly telling clients that unless their dog is 100% reliable on recall (returning to you when called); you have no control of your dog. This is a subject I have written about before. Hopefully reading this will make an impression on you. 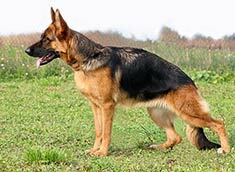 Your dog may sit, down, heel, stay, but unless your dog comes to you when called none of the previous matters. Group Obedience classes are a valuable tool. Learning to gain control of your dog in a group setting with other dogs under the same controlled situation is valuable. What you are doing is gaining what we are talking about; Control. 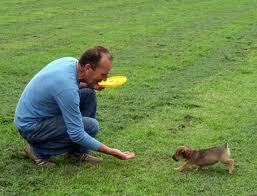 Then you can begin teaching your dog to return to you the first time you call him. If I had only one command to teach my dogs, it would be recall. Your dog must return to you when called. If your dog slips out of the gate or the front door and doesn’t return to you and there is a car coming his way, it doesn’t matter what else he knows. I have found the most successful way to begin to teach a dog control is on the leash. Once I have control of a dog on a six-foot leash in public under distraction, then I will begin to teach my dog on a long line and then off the leash and eventually in public under distraction. 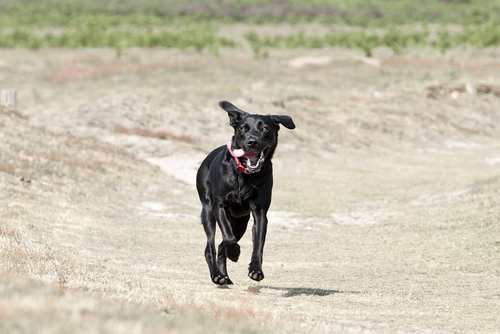 Many people think they have control of their dog off-leash. 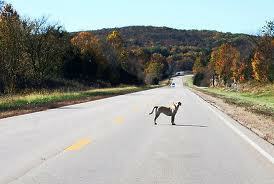 However it only takes one distraction to lose the control you think you have very quickly. 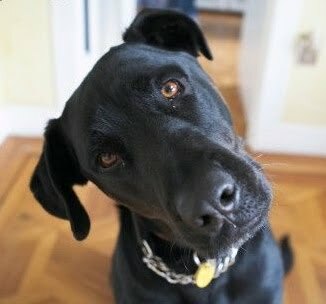 The problem is once your dog knows he can “break space” with you, you have lost any control you think you had. It’s much easier to never let the dog “get” that you are not in control. If training a dog that already knows he doesn’t have to come, be patient and consistent. Even the most stubborn dog can learn that he must come to you when called. 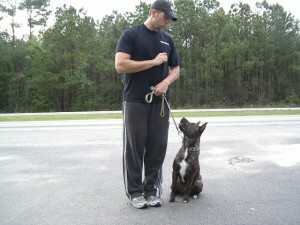 Learning to implement the tools to follow-through, gaining respect from your dog and creating the kind of control you need to have a dog respond to your commands will possibly save his life one day. 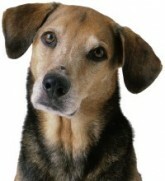 Click HERE for more information on teaching your dog the recall. There have been countless articles on the advantages of crate training your dog or puppy yet I still run in to people that believe it’s cruel. Here are a few of the reasons why crate training can be a valuable tool in raising and training your dog or puppy. 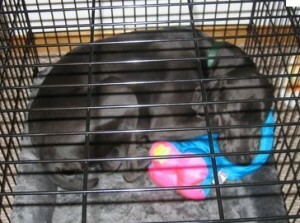 This will be my second article on crate training but I think it’s a topic that is worth repeating. At this moment I have a litter of thirteen three-week old Doberman puppies. Because of the size of the litter, today I decided they were getting a bit too big for their whelping box and decided to move them out of the box. Right now the puppies are in a room in my house across from my office. I keep the whelping box in the room so the mother can get away from the puppies if she needs to and the puppies now have the run of the room. In the room I have spread towels and newspapers on the floor, and the only other thing in the room besides the box is a Pet Porter crate. I take the door off so it’s easier for the puppies to get in and out. 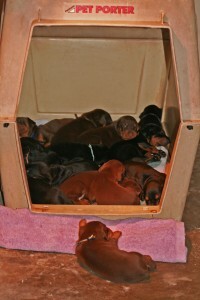 I found it interesting how when the puppies are placed in the kennel, they immediately group together and fall asleep. I also noticed that they stay asleep longer than if outside the kennel. By the end of the first day I saw more than one puppy leaving the crate to intentionally eliminate on the newspapers. This is at three weeks old mind you. What I’m seeing even on this first day is that these puppies find this kennel a safe place to be. Soon I will be attaching the door back on the kennel. This along with two other kennels to accommodate this size litter will be placed in the puppy area. When I clean the floors all the puppies will be placed in the kennels and the doors will be closed. 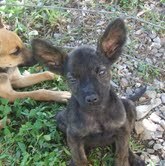 I will then place the puppies as a group and individually in the kennels for brief times during the day. Every time I place the puppies in the crate I will use the word “kennel”. By the time these puppies are ready to go to their new homes they will all find the crate a safe, comfortable place to be. They may even go in the crate on command. I can’t imagine raising a puppy without a crate. Allowing a puppy too much space in a house is what leads to accidents, destructive behavior and possible harm. 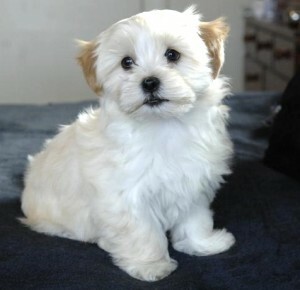 Crate training your puppy makes it much easier to teach your puppy a schedule of eliminating outside. 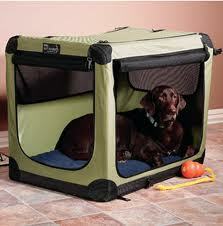 You can also feed your puppy in the crate which will ensure the puppy does not become lazy and potty in the crate. There are puppies that will naturally eliminate in their sleeping area but this can be the fault of breeders not keeping puppy areas clean and this can be resolved through training. A crate is a safe place. If you have company over that are not “dog people” or they have a small child that is not as well-trained as your dog, a crate gives the dog a safe place to go avoiding any possible unwanted scenarios. A crate is their place, where they will not be bothered or harassed. One of the greatest benefits of crating your “dog in training” or puppy is your home will be in the same condition as when you left. Leaving a puppy in a room alone may lead to destruction or even injury. 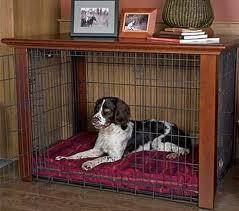 There are a few things I think are necessary before leaving your puppy or dog in a crate. 1. Take the time to properly train your dog to the crate. 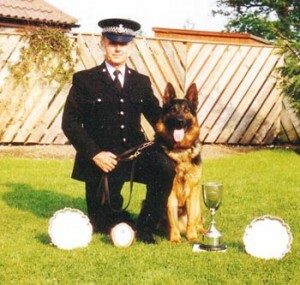 Most dogs can be crate trained in one or two sessions. An owner who avoids training and throws their dog in a crate will commonly see the dog become panicked and anxious. This can also lead to extreme difficulty in attempting crate training at a later time. 2. 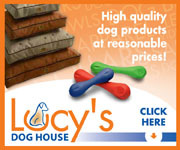 When considering bedding for a destructive dog or puppy. Never use bedding that the dog will be punished for if damaged. I always use old towels so if chewing occurs there is no chance of punishment. It is uncommon for older dogs to damage bedding and at that point nice crate padding can be purchased. 3. Consider what you leave in the crate. Leave the dog or puppy something to keep them occupied. Be sure when leaving toys or bones in the crate that they are not something that can be ingested causing injury to the dog. Kong products and others specifically designed for this are one option. Treats will also encourage the dog to enter the crate upon command. 4. Music soothes the savage beast. Consider leaving a radio or television on when you are not home. This will not only help in keeping the dog occupied, it will also reduce outside distractions which lead to unwanted barking. 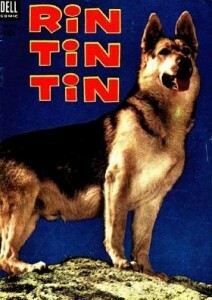 One thing I want to make clear is never leave your dog in a crate for long periods of time. Crating your dog is a useful tool but it can also be abused. If your dog is left in a crate for too long and is forced to eliminate, you are defeating the purpose of crating your dog. 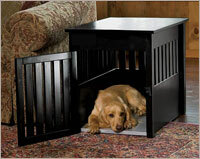 A crate must always be a happy and safe place for your dog. You will find once your dog is ready for total freedom of your home, you may want to leave the availability of a crate for your dog to enter when they please. As you can see by my illustrations, once your dog is training to the crate you can purchase a “designer” crate that is a pleasant addition to your home. Crate training equals faster housebreaking, less destruction and a happier dog. What is a “Designer Dog” you ask? 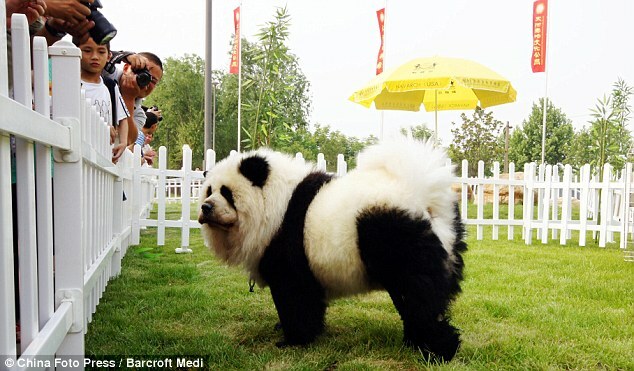 Take any two Pure Bred dogs, any two, breed them together and what you get is a Designer dog. When you buy a designer dog just like a designer purse, you may find a costly price to own this unique possession. Let’s say you have always wanted to own a Brussels Griffon and you have also always wanted to own a Poodle. Well, you can now buy a Broodle Griffon. Unfortunately, some breeders claim to fame on these mixed breeds or “hybrids” is that you will get the best of both breeds. Not true. You can also get the worst. 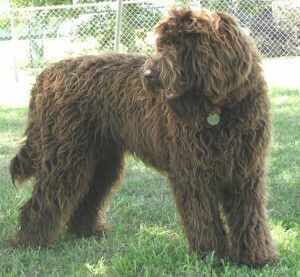 Labradoodles were one of the first designer dogs being bred and sold over 15 years ago. They were advertised as a curly-haired, friendly and outgoing hypoallergenic breed of dog . Even back then the price for one of these dogs went as high as $2,000 US. 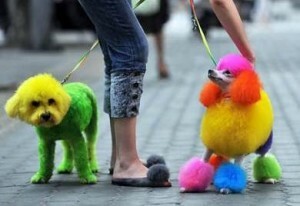 The truth is Poodles do not shed. However Labs do shed. The goal of breeding two purebred dogs is to get the best traits of each breed. 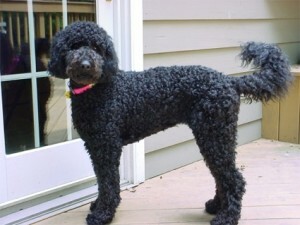 Put a Labrador and a Poodle together and you may get the best hunting dog ever. However you may also get the worst traits of each breed. Therefore it is important to research each breed and meeting the sire and dam are very important. Don’t assume that your dog will have a great temperament. And with any dog, it doesn’t hurt to seek dog training advice to further ensure a great pet. Designer dogs have become a huge fad in the US, being swept up by celebrities and other well known people. Popularity grows and as history shows, the dogs also become popular with pet stores and puppy mills. I’ve heard this many times and frankly I feel sorry for people who share this opinion. 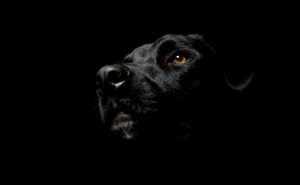 Anyone who loves dogs has more than likely suffered the grief associated with death. It’s very difficult for people who don’t feel the same way about dogs to understand the pain and loss we feel. There are many different forms of grief. How you deal with grief depends on how you were raised, the circumstances of death, religious beliefs and personalities. We will all grieve differently. 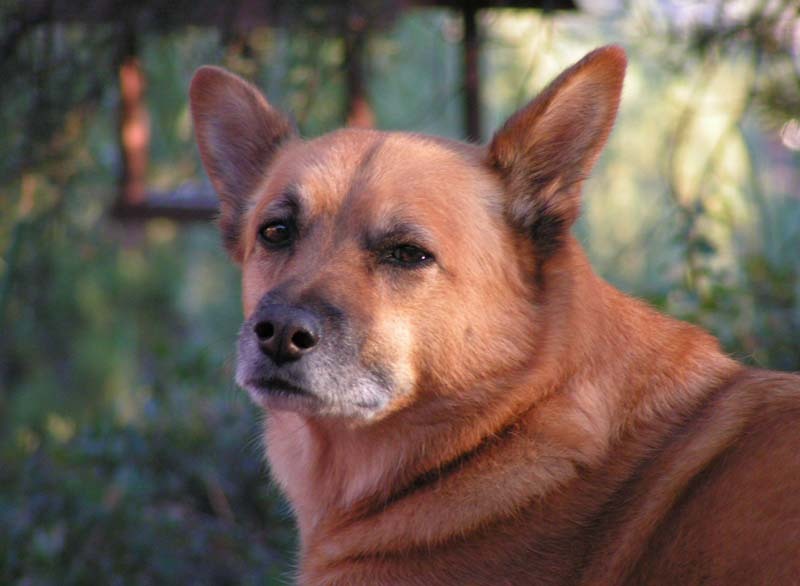 The death of a dog can range from sadness to one of the most devastating events in our lives. Sharing your life with a dog is different from most other animals. The unconditional love, bonding and emotional investment we allow ourselves to experience with a dog can be one of the most satisfying experiences in our lives. Unfortunately dogs don’t live long enough. To some people losing a dog is like losing a family member or a best friend. It can be very difficult for people who have never shared this kind of relationship to understand this type of emotional loss. There are different types of grief. Some dogs die after long and happy lives. Some dogs die senseless deaths at a young age. Again depending on our own emotional skills and environment, we may know that we gave that dog a good life and miss them very much or we may feel that we can barely go on without our beloved dog. No more chasing balls, no more hiking. Your breath smells bad, you can’t hear, you can’t see, you have accidents in the house and you are no longer as interested in pleasing me. Life with a young dog is much different than life with an old dog. Recently a client and very good friend of mine lost his dog Kyra. Let me say first that someone in my field often becomes very good friends with their clients. Being involved in the clients life because of their dogs is where the friendship forms. Some friendships last the life of the dog and some longer. Which leads me to Lou and Kyra. 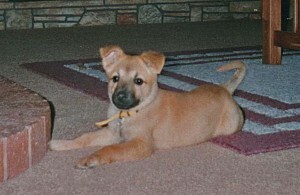 Kyra and Lou came to me when Kyra was about eight weeks old. She had been found two weeks earlier with a broken pelvis, radial nerve damage in her right front paw, head injuries, starvation and parasites. Everyone thought Kyra would only last a few months. Kyra, with Lou’s love, proved everyone wrong. The two shared life together for over 15 years. 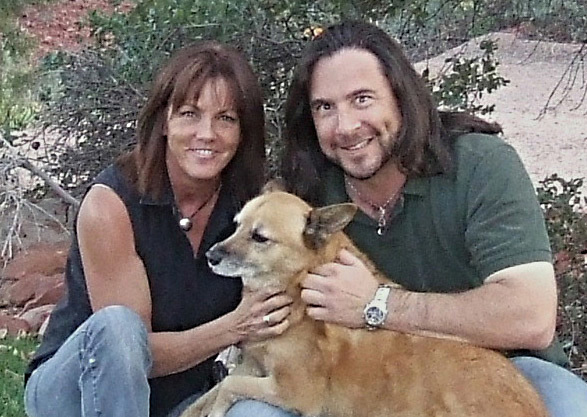 When Lou first came to me for training with Kyra, I could tell right away that Lou was the kind of owner that was prepared to do whatever it took to ensure he and Kyra could live peacefully together. Lou listened to what I told him, practiced and asked questions. Soon he and Kyra were quite the team. Kyra loved to hike with Lou. They spent hours in the beautiful rocks of Sedona, AZ. I was fortunate to be able to watch over Kyra when Lou would travel so she also became a part of my dog family. Lou traveled often and I almost felt she was part my dog as well. When I left Sedona, Lou and I kept in touch. I followed Kyra’s life to the end. When she became very old and started having serious trouble, Lou would call me and share his frustrations and sorrows. It’s not easy owning and caring for an old dog. You are battling conflict on a daily basis. For the last eight months of her life Kyra couldn’t get in the car anymore. Lou only left the house for short periods of time. He stayed by her side as she had always stayed by his. It wasn’t always easy, your life can change drastically when caring for an old dog. But Lou stuck it out. I remember times when Lou wondered if he was failing Kyra by considering euthanasia. I couldn’t tell Lou anything much more than Kyra is one of the luckiest dogs in the world to have an owner who loves her and has always loved her when other people said she didn’t stand a chance. I told him Kyra would let him know when it was time. Her last day Lou had gone out to run an errand. Upon returning he found Kyra standing in the kitchen with one of her hind legs awkwardly tucked in and up towards her body. She was frozen in that position and her eyes were looking off as if into another dimension. He asked her if she wanted to go outside and she stumbled towards the door. She made it to the grass where she laid down and never got up. He knew she was ready. When the vet arrived and started to shave her leg Kyra did not flinch or even look. As the vet inserted the needle Kyra didn’t respond. She just simply closed her eyes and moved on. That was December 24, 2010. Lou and Kyra began their life together on November 4, 1995. Living with an old dog can be difficult. But for all a dog gives us unconditionally including love, devotion and laughter, the least we can do is give them a piece of this when they need it most. I was fortunate enough to share a part of the life of Kyra and Lou. Luckily we are able to hold on to the memories of a little red dog that touched our lives in such a big way and meant so much to us. They call it “colorizing”. Groomers have been doing this to their dogs for years but now it seems to be the craze for pet owners in Japan. 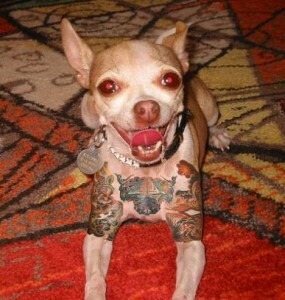 Then there is tattooing your dog. No, not the simple tattoo in the ear or hip. 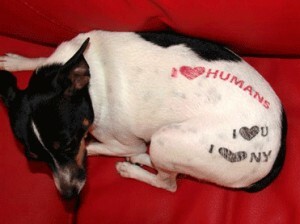 This is being done to not only dogs but also hairless cats and even pigs. This procedure is usually done while the dog is under anesthesia and can be a very lengthy process. I would think finding a veterinarian to administer anesthesia could be difficult at best. 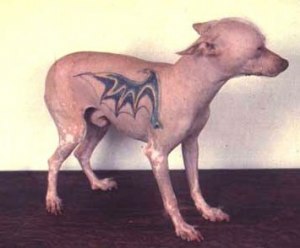 Apparently only dogs with pink skin can be tattooed. The ink is absorbed in to the skin on dogs with black skin. 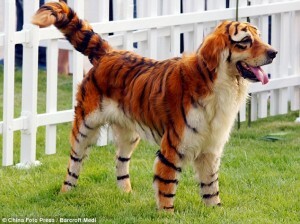 This “art work” is being performed on animals by some fairly famous artists. Many people view this as cruel, many view as art.